Orange Butter is derived from Orange Peel oil and Orange Peel Wax, specifically from the Florida area, and is obtained by cold pressing of Orange Peel followed by a full refining process. The natural oil contains Limonene, which is a very effective free radical scavenger. Orange Peel Oil has a cleansing and toning effect on skin that can improve oily skin and acne problems. Also contained in Orange Butter is Orange Peel Wax which contains a high level of Bioflavonoids (polyphenols). Bioflavonoids have anti-cellulite, anti-inflammatory, and many other protective benefits for skin. In cosmetic preparations, the clean and refreshing scent of Orange Butter not only smells fragrant, but the Orange wax can act as a co-emulsifier which can increase emulsion stability. 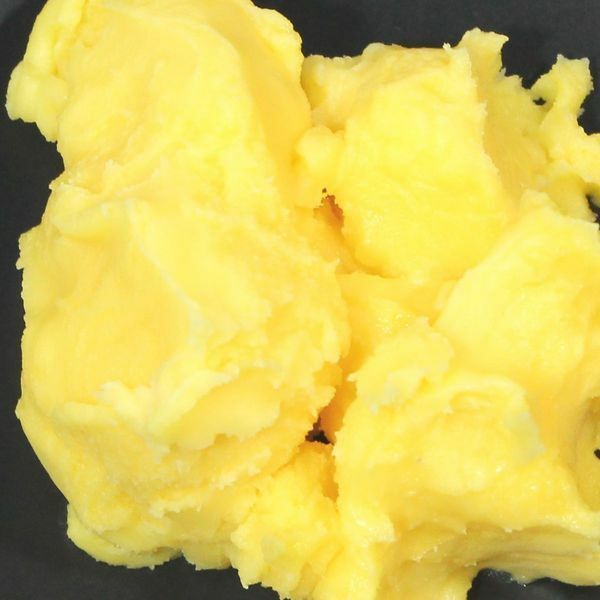 Orange Butter exhibits excellent spreadability on the skin, making it ideal as a massage butter or carrier for treatment products. It adds moisturizing attributes to creams and lotions and bar soaps. May be used in cosmetics, toiletries, soaps, massage oils & balms, hair care and sun care preparations. This orange butter is amazing. A little here and there goes a long way. I am going to make cream for the eyes. It is amazing and melts on your skin. i love the smell of this and the color is so pretty!